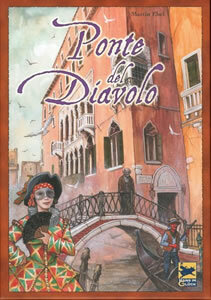 Ponte del Diavolo is a game by Martin Ebel and published by Hans im Glück. This game honors both game designer Alex Randolph and Twixt, one of Randolph's most enduring designs. The players try to create as many islands as they can and connect them with bridges. The original game is played on a 10x10 board, but on YourTurnMyTurn.com it is played on a 12x12 board allowing more tactical options. The first player (white) takes two of the white tiles and puts them on any space of the board. The other player now chooses whether to play with the white or the red tiles. If he wants to play with white he must click on a white tile, if he wants to continue with red, he has 2 place 2 tiles on the board. This is the so-called "Alex Randolph starting rule" (or pie rule). The game continues turn by turn. On your turn, you place either two tiles of your colour on any free spaces of the board (the two tiles do not need to be next to each other) or one bridge on two of your tiles. An island is a formation of 4 tiles of the same colour, touching side-to-side (not just diagonally). An island always consists of exactly 4 tiles, never any more nor any less. They can be of any shape possible. A sandbank is a group of 1, 2 or 3 tiles of the same colour. An island cannot touch another island of the same colour or sandbank of the same colour. It cannot even touch diagonally (Distance rule, see example 1). Sandbanks can touch each other diagonally (examples 1 and 4). They can only be extended to form an island if they then do not touch any other island or sandbank, of the same colour, and do not consist of more than 4 tiles (examples 2, 3 and 5). The distance rule does not apply to islands or sandbanks of different colours! (example 6). These 5 island shapes, as well as mirror images, are those possible. 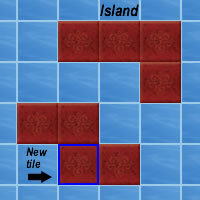 Example 2: A tile cannot be	placed on this space to form an island from the 2 sandbanks, as the distance rule would be broken. Example 3: An island can be formed here. 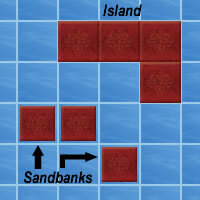 Example 4: The player extends a sandbank. Example 5: A tile cannot be placed here, as you cannot have a formation of 5 tiles of the same colour. Example 6: Tiles of different colours can touch each other without restrictions. A bridge connects 2 tiles of the same colour which have one space separating them (example 7). A tile can only support one bridge (example 8). A bridge cannot be built over tiles of either colour (example 8). 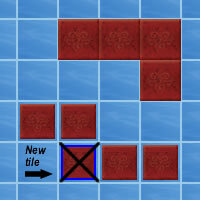 Tiles cannot be placed under a bridge and so there will be 1 or 2 blocked spaces underneath (example 9). Blocked spaces are only for tiles, not bridges. Bridges can be build over a blocked space, so parallel horse jump bridges are allowed. Bridges cannot cross and may not be build (partly) on top of each other. Example 7: Bridges can be built in these 3 different ways. Example 8: The bridges to the left can't be built like this as a tile can only support 1 bridge. The bridge to the right can't be built as there is a tile under it. Example 9: Spaces 1-4 are blocked. Game End and scoring method. 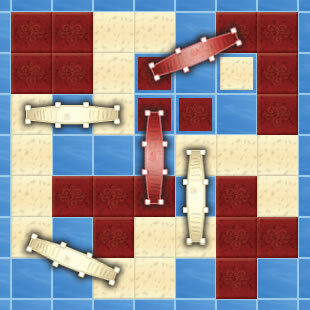 If the white player can no longer place two tiles and does not want to build a bridge, the red player has one more turn. 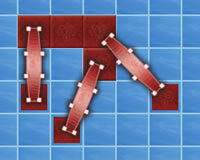 If the red player can no longer place two tiles and does not want to build a bridge, the game ends immediately. The winner is the player with the most points. If there is a tie, the winner is the player with the most islands. If there is still a tie, the winner is the player with the most bridges. If there is still a tie, the game ends in a draw. Example of scoring on a small board: White has 4 connected islands: 10 points. 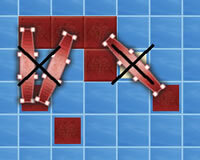 Red has 2 connected islands (via a sandbank): 3 points. He also has 2 single islands: 2 points. Red has a total of 5 points. Centre is Strong: When white offers the center, take it. Try to work from here like a spider, creating connecting bridges in all directions. Do not Enlarge Sandbanks to Islands Easily: Hide your plans from your opponent. First build bridges between sandbanks, you can still make the islands later. Bridges to the Middle: If you have a choice for different bridges, don't take the end of an island/sandbank, take the center, the end might be powerful to expand into the board later. Burned Land: Avoid having diagonally touching sandbanks (sizes 2+3 or 2+2). The waste land which you have to circumvent later. They can be useful however when blocking your opponents connections. Watch out for 1+2 diagonally connected sandbanks, your oppenent might make them burned land with a diagonal bridge. 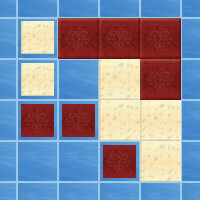 Split the Board (into two parts): Try to create a chain of islands and sandbanks connecting opposing edges or even corners of the map. This will bring your trouble for your opponent. Quandary or Fork (or Miai in Go terms): This is a powerful instrument, well known from nine men morris (or mill). 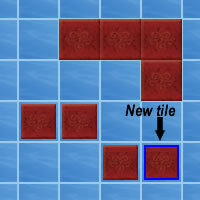 Places tiles, which immediately give you two ways to build a bridge or complete an island. When the opponent can block you with his two tiles, you weren't yet there. 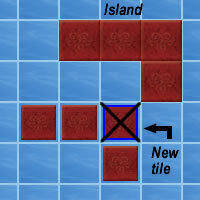 Guide your Opponents Building of Islands: Often a single tile in a useless position can force your opponent to expand in a direction which does not really help him. 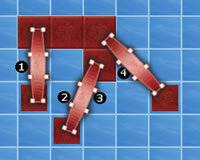 Especially an opponent island with one free row to the edge of the board preserves you space for later usage. Note that you can cut a planned horse jump connection of your opponent by only one intervening tile. Take Space: Try to conquer space. Leave areas uncompleted when they are safe. But do not loose track to revisit them later to build the required bridge or land. The "Kairos": The right moment in end game (from ancient greek) to decide that its time to stop building islands and blocks and start building scoring connections. The skilled player has an eye on how many turns his opponent has left and what he has to finish himself. In extreme case, the game might finish before you made your winning connections. Aggressive and Mean: The design goal of this game was to make bridges more mobile to create an intuitive, constructive and connecting game. It was meant as a Homage to Alex Randolph and his opus (and takes some inspiration from twixt, where bridges are restricted to horse jumps). However experienced players have taught me, that you can play the game very destructive and win games with final scores like 2:0. Play as aggressive and mean as required, but after the game leave the board as friends.